NEW YORK CITY – The Seattle Storm selected Eziyoda “Ezi” Magbegor, Anriel Howard and Macy Miller tonight in the 2019 WNBA Draft presented by State Farm, held at NIKE’s New York City headquarters. The 19-year old Australian standout joined the NBL1’s Geelong SuperCats in March after reaching the WNBL semifinals with the Melbourne Boomers. Magbegor averaged 8.7 points and 4.3 rebounds per game while shooting 56 percent from the field in her first season with the Boomers following a 2018 WNBL Rookie of the Year campaign with the Canberra Capitals. Magbegor earned a silver medal as a member of the Australian Opals 2018 FIBA Women’s World Cup team. The 6-foot-4 forward logged 10 minutes in the championship game against the United States, collecting six points and four rebounds while facing Sue Bird, Jewell Loyd and tournament MVP Breanna Stewart. The Storm also added forward Anriel Howard with the 24th overall pick. The 2019 consensus First-Team All-SEC selection averaged 16.4 points and 8.4 rebounds in her sole season at Mississippi State. Prior to joining the Bulldogs as a graduate transfer, Howard set Texas A&M program records for career rebounds (1,002) and double-doubles (32). “Anriel is possibly the best defender in the draft, an incredible rebounder, and showed offensive development in her career that we are confident will continue to grow at the professional level,” said Hughes. With the 36th and final pick in the WNBA Draft 2019 presented by State Farm, the defending champion Storm selected guard Macy Miller. The two-time Summit League Player of the Year led the Jackrabbits to a Sweet 16 appearance in the 2019 NCAA Tournament. Miller finished her collegiate career as the Summit League all-time scoring leader with 2,355 points, maintaining a 49.9 field goal percentage, including 40.1 percent from three-point range. 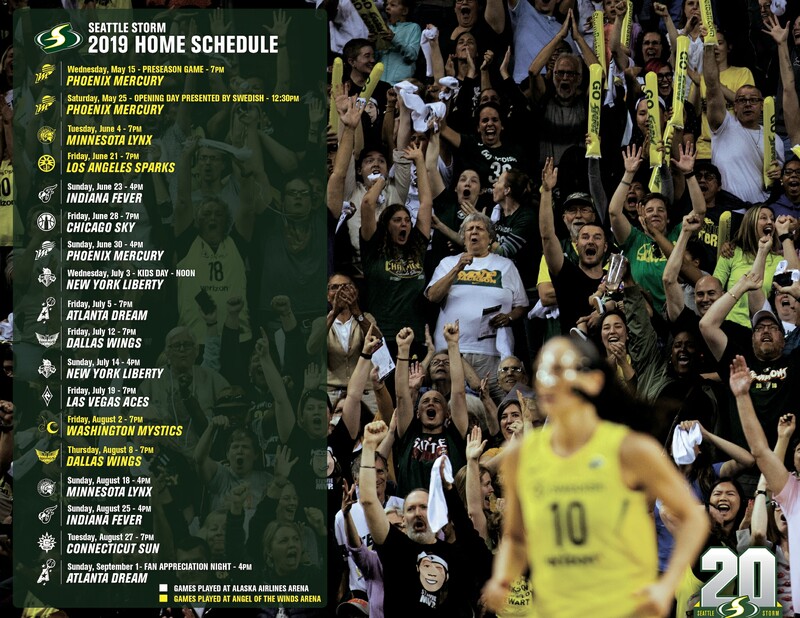 The Seattle Storm today announced single-game ticket information for the 2019 season. Fans can purchase by visiting StormBasketball.com. Raise the trophy with the Storm in 2019 with a Storm 360 Membership, ticket package or group experience, available by calling (206) 217-WNBA (9622).